Chloe will be joining Beatrice, another rescue dog, at her new home with a retired couple in Long Beach. Maryanne and Doug James — a retired couple in Long Beach — adopted Chloe on Friday after being selected from a pool of 75 applicants. Chloe was found emaciated and shoved in a dumpster in December. A $20,000 reward is being offered to find Chloe's abuser. 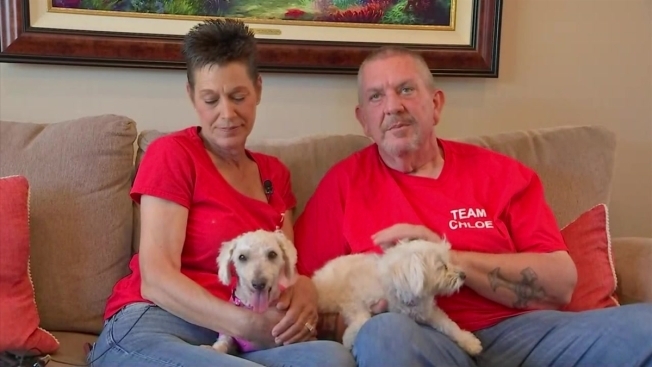 When Maryanne and Doug James heard about the 1-year-old poodle-terrier mix named Chloe that was brought back to health after being dumped in a trash bin, they just had to have her. So the retired couple from Long Beach adopted her on Friday. "She's very loving," said Doug. "It's amazing that she is the way she is after all that's happened to her." Chloe was found in a trash bag with a fractured skull and a broken leg in a Long Beach trash bin in December. Miraculously, she survived. But her case elicited a $20,000 reward for information leading the person who abused and abandoned her. Chloe visits the doctor after months of physical therapy and rehabilitation. After making a recovery, Chloe was put up for adoption in March. And the James' were among dozens of people who applied to adopt the cuddly pooch. "They are just very giving people," said Diana Kliche, who helped with the rescue. "We knew that Chloe and Beatrice would have great futures with them." Beatrice is another rescue that the James' adopted as well as a companion for Chloe. "We feel like we've won the lottery," Doug said. Added Maryanne: "We just love them so much. We're going to make it the best years of their lives."